I watched the ESPN coverage of Kurt Warner’s anticipated press conference yesterday in which he announced his retirement from the National Football League. Warner has always been a class act, and on the final stage of his playing career he didn’t disappoint. Warner said some very gracious things about others around his life who gave him a chance and then a second chance to play the game he loved. But it was his testimony of faith that was especially impressive. As he credited God for his success, Warner made a statement describing the Bible as a book of stories about average people through whom God did extra-ordinary things. As he continued, he cited himself as just another average guy through whom God had blessed to accomplish things that were beyond himself. Congratulations, Kurt, on a great career! We’ll miss your play, for sure. Even more, we’ll miss your character and the passionate faith you brought to the stadium each week of the season. May God grant you stages in the future that will continue to allow opportunities for you to honor the One who has honored your life! Reading through Genesis 12:4-9, the biographer reports on two occasions that Abram stopped and erected an altar in the midst of pagan people. If you read on you’ll observe that through his life he built many more altars that would become spiritual markers for him. In the midst of all of the transition, change and uncertainty of his life, worship kept him grounded. Worship reminded him that he was a part of something far more significant than himself. With each act of worship Abram was renewed in his calling and the eternal purposes that God was achieving through his faithful obedience. More importantly, worship fed and strengthened his relationship with God. Worship will serve the same purpose for you. I believe that one of the reasons we become overwhelmed is because we attribute greater value to our problems and our adversity than we ascribe to God. When God is diminished in our lives due to our lack of worship, fear and worry becomes daunting. But when we worship, God becomes bigger than life itself and everything is put into clear perspective. One way we can address fear and worry is to erect an altar of worship right at the source of our problem. Are you worried about your job? Erect an altar of worship at work. Are you concerned about your family? Erect an altar of worship in your home. Are you worried about your financial situation? Erect and altar of worship where you pay the bills. Fear and worry cannot co-exist with true worship that invokes the presence of God. Where do you need to erect an altar to the Lord? The story of Abram begins abruptly in Genesis 12:1-3. Following the death of his father, Abram received a special call from God to leave the security of his comfort zone and begin living the adventure of faith. God’s first word to Abram was “leave.” The reader might expect the first word to be “go,” but it wasn’t. Here’s the simple truth: you can’t go until you leave. I know this sounds trite, but it’s true. Years ago I remember hearing John Maxwell say “break-throughs are always break-withs.” You have to leave before you can go. Sometimes I am asked to provide some pastoral advice on how to determine God’s will when facing a transition. When people ask me about making transitions, I share the same three questions that I have always applied to my own life when confronted with this kind of decision. 1. Am I finished? Has God released me from my place? Have I completed what I set out to complete? 3. Are those closest to me on board, particularly my immediate family? Your decision to “leave” and “go” will impact others. If you’re facing some tough choices, try giving these three questions a try. See if they will help provide clarity in the midst of confusion and doubt. Do you ever reflect on how you came to live in Central Iowa? Some of us may be natives who have never really gone far from home. Others are native, who, after a time of checking our greener grass in other places have returned. Others among us are transplants, traversing from faraway places while navigating a myriad of twists and turns before eventually landing here. Some of us will die here and here we will be buried. Others will have one or more transitions in us before we come to our final resting place. How you got here is always an interesting story. More compelling, however, are questions like “Why are you here?” and “What are you doing during your time here?” God has created and gifted you to be who you are and what you are. But don’t forget to consider that God is also interested in where you are. That matters too. Woven into the story of Abram is an extensive travel log. His purpose? To found a new nation that would be a blessing to the world. His story doesn’t begin in Canaan. It begins in a place called Ur. Reading Genesis 11:27-32 provides us with the back story of Abram. It proves to be informative. For example, we learn that Canaan to some degree had always been on the map for at least two generations. Abram’s forefathers had been working their way to Canaan for some time. So God had prepared Abram for his special call with an inclination of heart. Finally, we learn that through a life changing event, the death of his father Terah, God’s call came to him. It’s interesting how significant events — death of a family member, loss of employment, dissolution of a relationship, an unexpected illness — turn our attention to God and make us seek Him. Though we live life in real time, I believe life is best understood through history. Abram is known for leaving his home land and moving to a new place. But the back story helps us see how God has prepared him for a new venture. I think it works that way for us too. No one wants to live in the past. Sometimes we can get stuck if we dwell on the past. But nothing is more helpful to understanding your present than a clear understanding of the past. If you want to understand today, you need to begin by understanding yesterday. Since I’ve been married I’ve moved seven times. Seven times in nearly 25 years. Some of those moves were simply across town. Three of them crossed state lines. The moves across town were aggravating because we didn’t take the time to pack as carefully as we did when we made a major transition, so some stuff was broken. The long moves were aggravating because they involved substantial planning and expense, so I felt broken. But each move had one thing in common…we knew our destination. We had the house picked, complete with address and everything. Abram? Not so much. When God invited Abram to become involved in his plan and purpose the destination was not disclosed. Abram was simply to pack the truck and head south until God told him to stop. How do you respond to those invitations to participate in the work of God? Like Abram, we respond to the invitation of God through faith. As Christians we talk a lot of faith, but sometimes our conversations are somewhat uninformed. What do we need to know about faith? First, faith is my response to the revelation of God. God discloses himself to us, and that disclosure is the invitation to respond to God. No where does the Bible suggest that believers are to sit and trump up stuff to do for God. More often than not, that kind of thinking only leads to trouble. God discloses himself and his plan and I respond to him. Second, faith reveals what you really believe about God. Faith is relationship based, not task based. It is not about assessing the actions of God but about assessing the character of God. What I do when God reveals himself to me and invites me to join him speaks volumes about what I really believe about God. Third, growing faith is a cycle of revelation and response. Like getting to know someone, God discloses himself in stages. We know God to the degree that he makes himself known to us. Each time we respond to what he reveals, he discloses himself a little more fully. He reveals and we respond. He reveals himself again and we respond again. You get the point. Responding to God in faith, then, becomes a life changing experience. It creates urgency, passion, and meaning. Following God is no longer a big deal, it is the deal! When you pursue God and participate in what he’s doing, you experience a paradigm shift from seeking success to seeking significance. Remember, Abram was already wealthy. He had more money than he could ever hope to spend. But he wasn’t blessed by God. Abram didn’t know everything, but he knew enough to realize that success wasn’t enough. He realized he’d been created for significance, and that significance would only be found in walking by faith and participating in God’s eternal purposes. He could not go with God and remain as he was. Neither can we. We spent our first day at Disney in its most storied and celebrated park: The Magic Kingdom. There we were able to see Disney at its best. 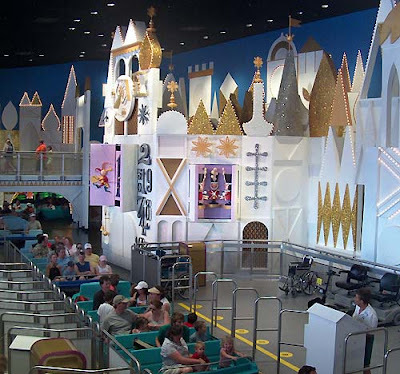 We rode the classic rides, the most famous of which toured us through the seven continents where we heard dolls sing “It’s a Small World After All” in several languages. This was just a taste of what we would learn to be one of Disney’s most significant values…Think Globally! Disney has made the world its platform, opening parks in places like Europe and Asia. But Disney has not just taken their brand to the world, the world has come “home” to Disney here in the USA. I didn’t keep official statistics, but I felt continually surrounded by tourists from foreign countries. I stood in a concession line with newlyweds from Wales. We rode a ride with a family from France. I had my picture taken with a family from Brazil celebrating a wedding anniversary. (That’s another story!) Between the attractions and the guests, I was reminded that I live in a small world that has shrunk even beyond the imagination of Walt himself. If you haven’t noticed, our nation is changing. Rainer Research is predicting that our nation will turn caucasian minority by 2042. The preschool population of America will turn caucasian minority by 2021. Those events will presumably happen in our lifetime. Many of us began 2010 by making New Year’s Resolutions. This common practice is usually accompanied by the common practice of breaking the New Year’s Resolutions. Why do we have a hard time keeping those pesky promises we make to ourselves and to others? The basic definition of a resolution is “a formal expression of a good intention.” And well intentioned we are. 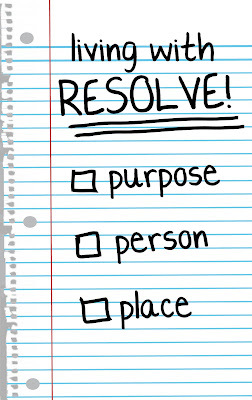 This year I’ve decided to move past resolutions and begin living with resolve. The word resolve is defined as “a definite and earnest commitment.” Maybe the difference between resolution and resolve is semantics, but the more I think about it, the more I believe I’m on to something. So rather than live in accordance to “good intentions,” I’m choosing to make some definite and earnest commitments. The Old Testament character Abram (a.k.a. Abraham) is an example of a person who lived his life with resolve. His life is the basis of our inaugural 2010 sermon series. Last weekend, from Genesis 12:1-4, I posed three questions to help you move from resolution to resolve. Question one: Are you aware that God has a plan and a purpose presently at work in the world? God’s plan and purpose has been settled from eternity past to eternity future. His plan is revealed to us in time and space, but it’s not for time and space alone. It remains eternal in its scope and dimension. Having said that, I think it’s fundamental that you realize that God is at work in the world around you whether you recognize it or not. For example, the air around is full of radio waves and all kinds of signals. You’re consciously not aware of these signals unless your cell phone rings or you tune in to a radio station or you open your laptop to search for a wi-fi network. The activity of God is like that. It’s around us everywhere all the time. Question two: Are you willing to be included in the activity of God that surrounds you? God’s purpose and plan includes you. In the Genesis account, Abram was not seeking God but God was seeking Abram. know that the choices he would make would impact the world geographically and politically for generations to come, even to this present moment. What that means is that your life is a bigger deal than you may have originally imagined! God knows you and has chosen you to participate in his purpose for the world. The final question is this: Are you ready to participate in God’s plan and purpose? Are you ready to accept his invitation? One thing I learned from Henry Blackaby is that God’s call to participate in his purpose is simultaneous with his timing. When God speaks, it is a present tense moment and requires an immediate response. Are you willing and ready? It takes both to be fully obedient to God. As you think about 2010, think about what is stirring in your heart. That may very well be a part of God’s invitation to you to join him in his awesome work. What are you going to do about it? What do you think of when you hear the word “classic?” As a guy in his mid forties I tend to think of classic automobiles, such as the ’57 Chevy or the ’65 Ford Mustang. One of the more intriguing things about Disney World was its ability to retain all that is classic without becoming a historical land mark. As a Baptist, I think there is great value in our tradition. The early church, after all, was rooted in the tradition of Old Testament Judaism. Those first and second generation believers retained important traditions that contributed to how they would worship, fellowship, and even govern themselves. At the same time they abandoned the practices that were no longer appropriate or feasible. I think churches and individual Christians periodically need to evaluate matters of faith and practice with this illuminating question: Are we cherishing time honored traditions? Or are we merely perpetuating history? Believe it or not, I am not against tradition. We all have them. As I reflect on how my family recently celebrated the Christmas holiday reveals that tradition is both helpful and healthy. However, we can quickly lose sight of the value of tradition when our lives, our families, and even our faith is reduced to perpetuating history. If all we do is perpetuate history, nothing meaningful is accomplished and we eventually end up alone wondering why the world has passed us by. Here’s the artwork for my new weekend series on the life of Abraham! Great clip shared with me by Brent Clark.